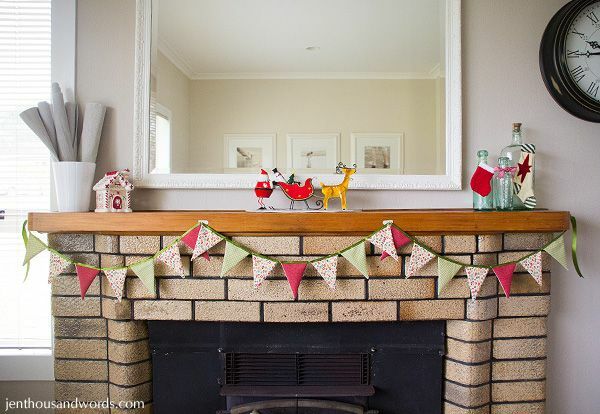 I adore bunting, it is so cute and festive. 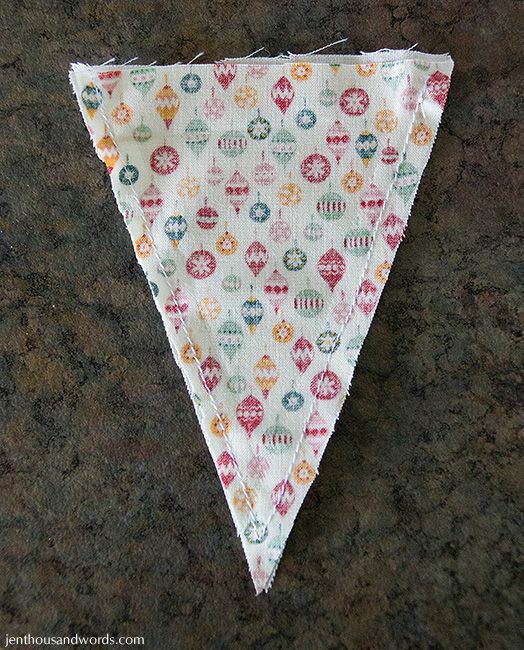 I had some Christmas fabric in my stash and decided to make some Christmas bunting to hang on our dining room mantel. 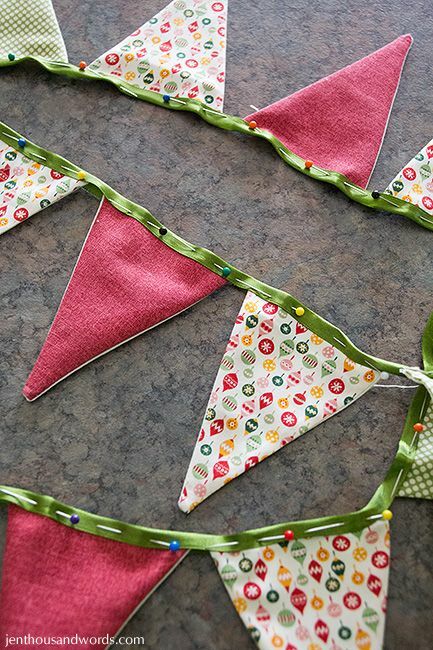 Making bunting starts out a bit like quilting - you decide on a colour combination, choose some adorable patterned and plain fabrics and cut out simple shapes using a template. 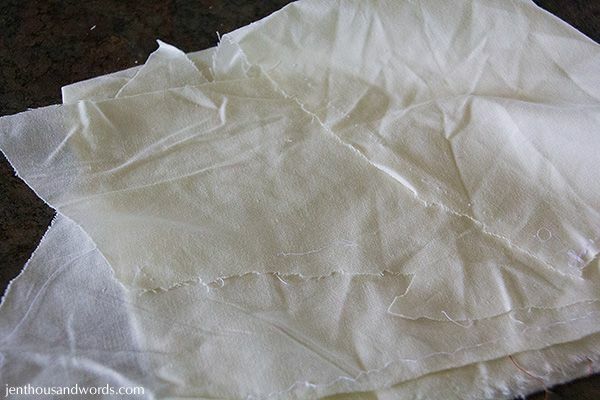 Even the sewing part is not difficult. 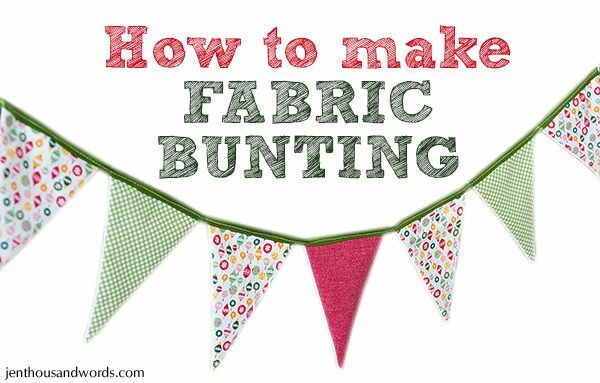 I decided to make a tutorial as I went about making my bunting, and share some tips that I've learned along the way. First, decide on the colours and fabrics you'd like to use. 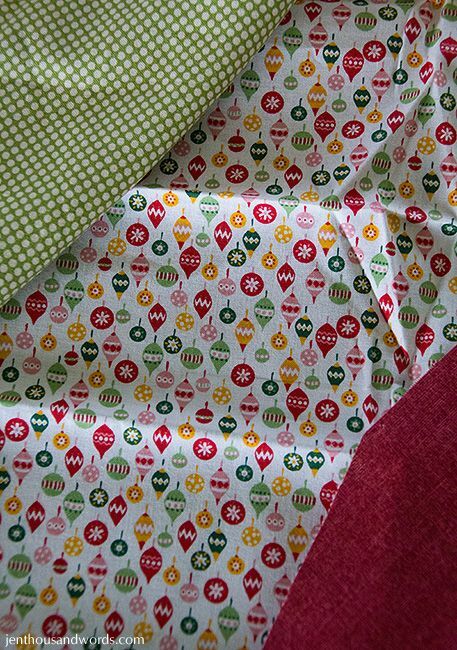 I chose a Christmas fabric from my stash (I'm sorry, I don't know the designer / brand as I've had it for years and there's no selvage) and a plain red and green polka-dot that co-ordinated. 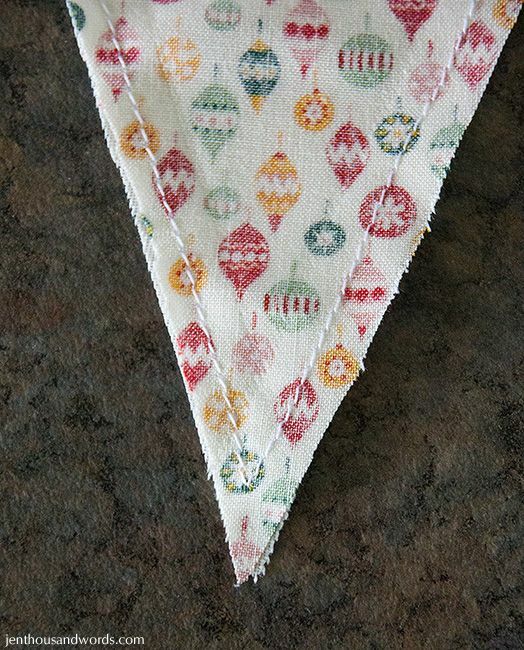 I also picked out some cream fabric scraps to use for the back of my bunting. 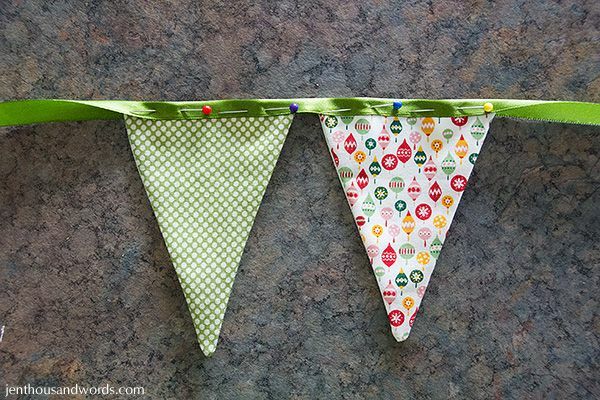 Tip: If you'd like to make your bunting reversible, feel free to choose coloured and patterned fabric for the reverse side too - perhaps Halloween on the front and Christmas on the back! 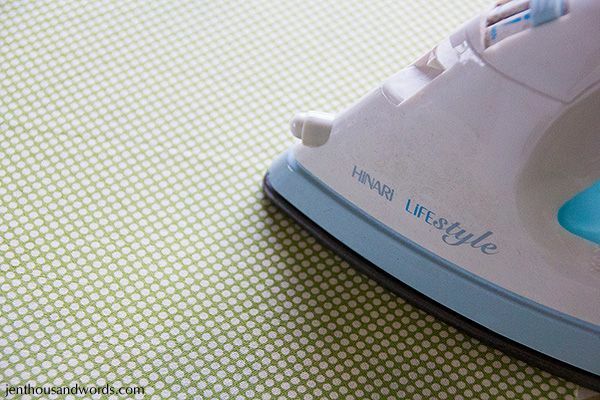 Once your fabric is ready you can begin making your template. 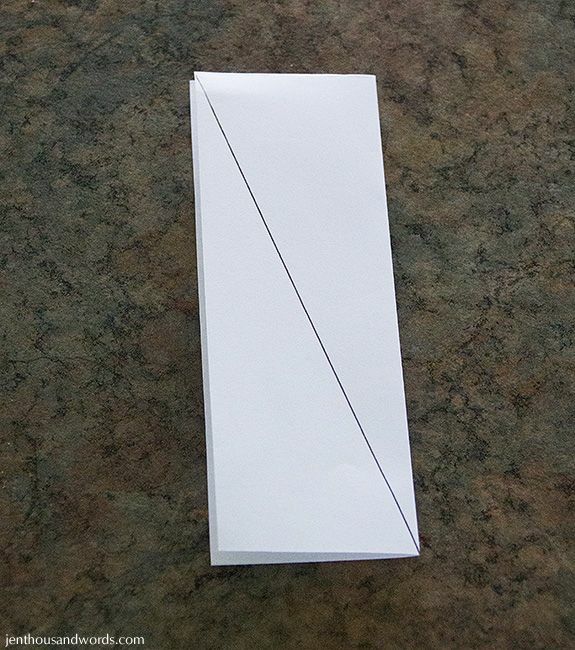 Decide how tall and wide you want each triangle to be and cut a rectangle of paper that size - I went with a fairly narrow shape. 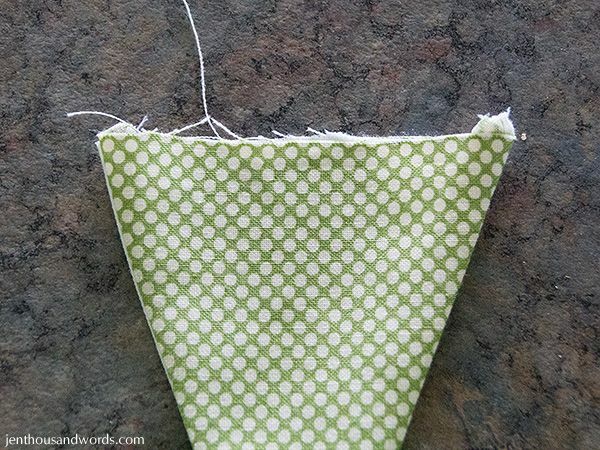 Tip: Make the rectangle slightly taller and wider than your desired bunting shape to allow for seam allowance. 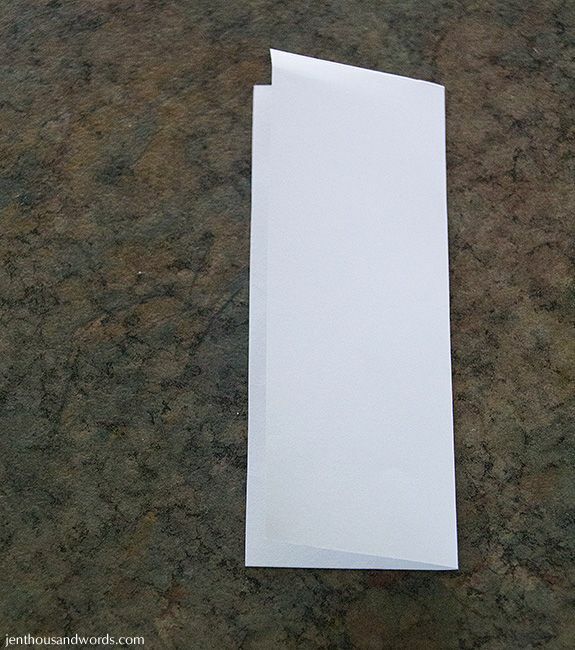 ... and, using a ruler or other guide, draw a line from the centre (where the fold is) to the top outer corner. 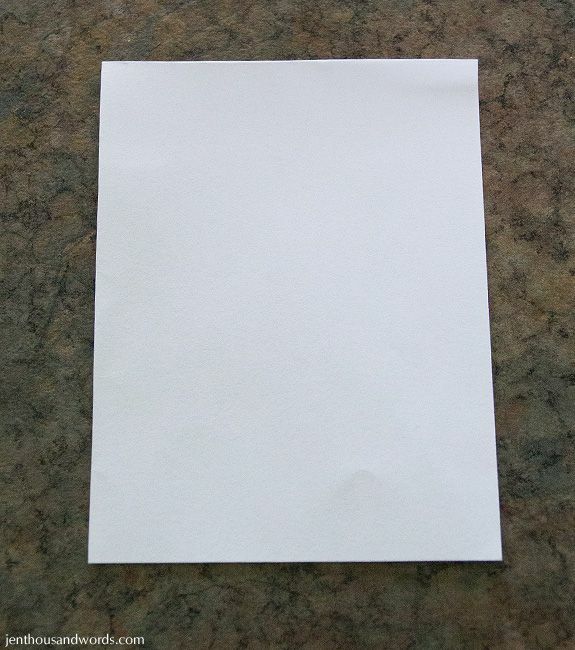 Cut along this line, unfold your shape and voila, you have your template! If it's not quite right, try again until you are happy with it. There's no science to it, you just need to end up with a triangle that's pleasing to you. 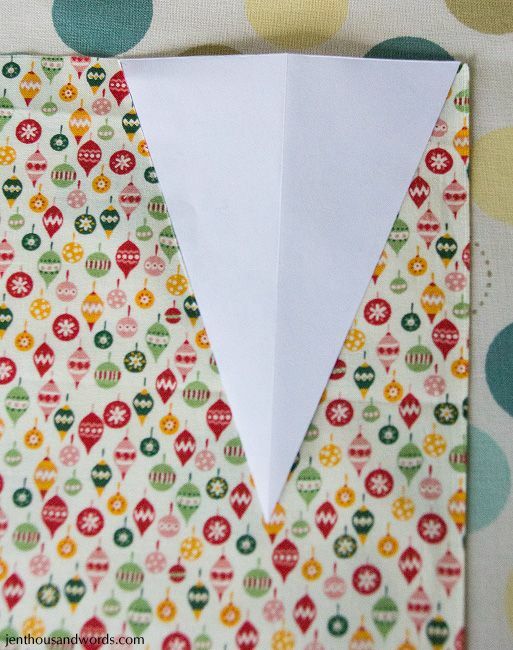 Lay your template on your fabric and cut out the shape. Feel free to pin it to the fabric if you prefer. No matter the angle of your triangles they will always nest agaisnt each other when turned, enabling you to cut one vertically and one horizontally in a row. 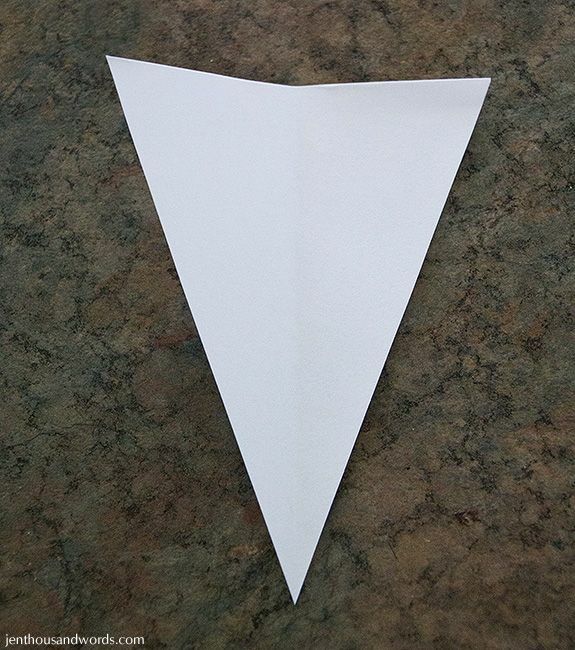 Tip: Be aware that half of the triangles will have the pattern upside down if you do this. I didn't mind too much with the small Christmas bauble pattern I was using but it would matter if it were something like animals in the print - half of them would be standing on their heads! 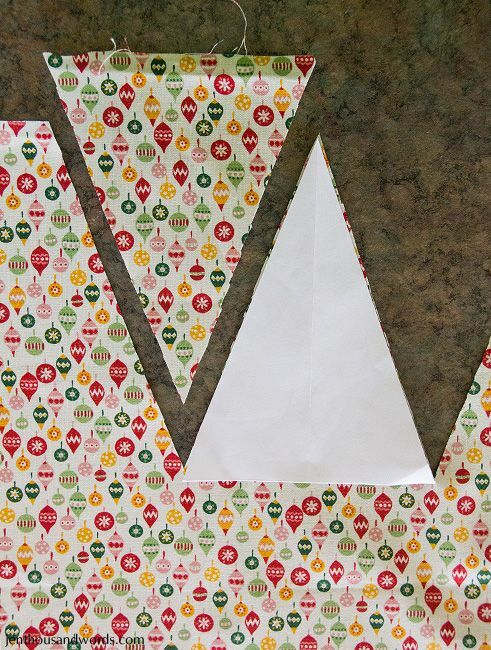 Once you have cut out all of your patterned triangles, go ahead and cut out the backing fabric too. Then lay them out in a line to plan out your design. 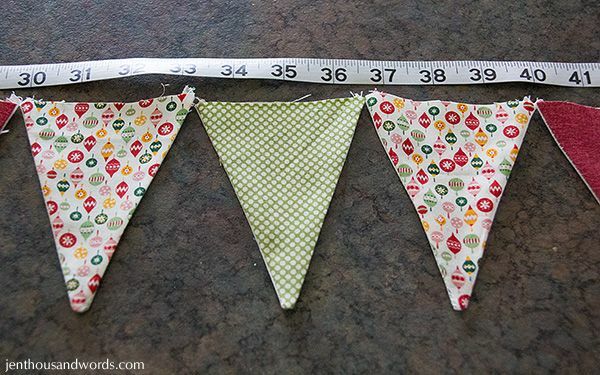 Measure the length to make sure it is about right, then cut one or two extra triangles for the end as the entire row will shrink a little once the triangles are sewn. 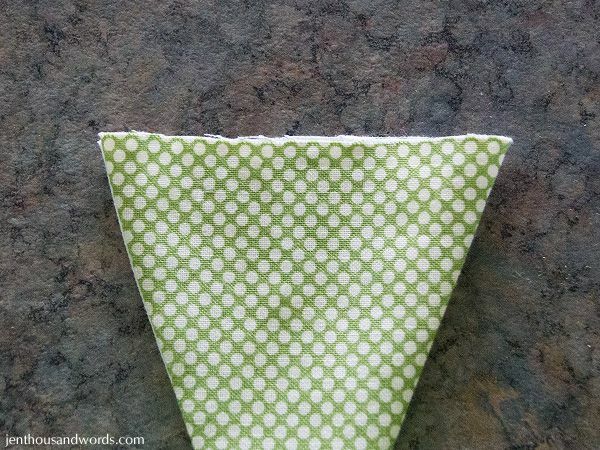 Take a triangle, match it up with the backing fabric with right sides together and stitch along the V, leaving the top edge open. See this point? If you turned it inside out now you would have all that fabric trying to bunch up inside that narrow pointed portion and it would be a mess. So you want to take your scissors and carefully trim down that V, making sure you don't cut through (or too close to) the stitching. Once you've trimmed it, turn the triangle inside out and use something sharp (like a metal skewer) to gently press out the point. Don't be too heavy-handed or you'll push the skewer right through. The points don't have to be arrow-sharp! 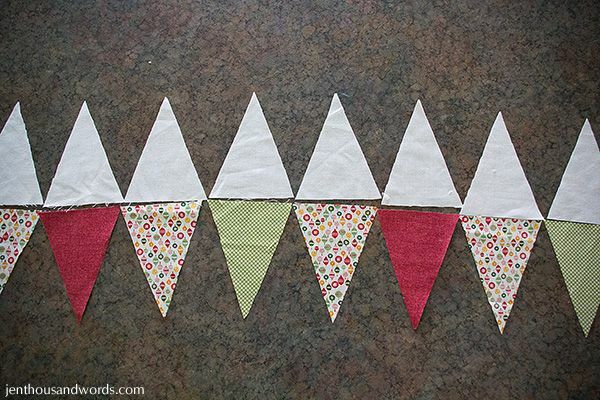 If you're happy with the length then you can move on to trimming your triangles before assembling the bunting. If you look at the top edges you'll notice little corners of fabric poking out on either end, and possibly some loose threads along the top too. You should have some bias binding or ribbon ready. I used half-inch green satin ribbon from the dollar store - I wouldn't recommend using ribbon any narrower than half an inch, or sheer ribbon that would show the raw fabric edges. 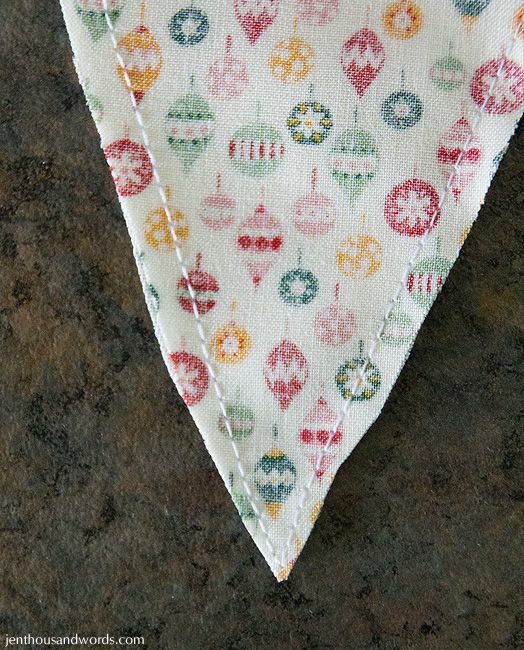 Decide how much loose ribbon you want on either end of your bunting (I left about a foot), then lay your first fabric triangle onto the ribbon lining the top of the triangle up with the centre of the ribbon. 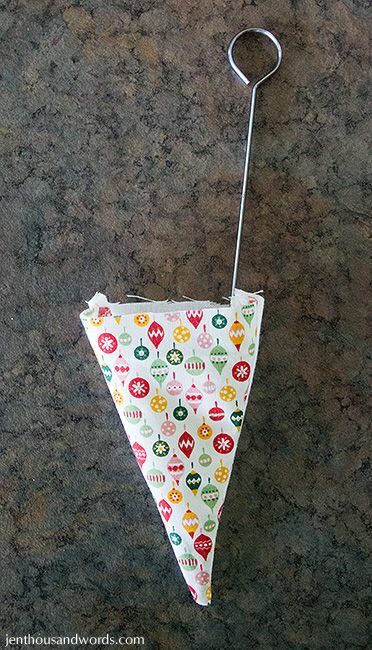 Then fold the ribbon over and secure with two or three pins, depending on how big your triangles are. 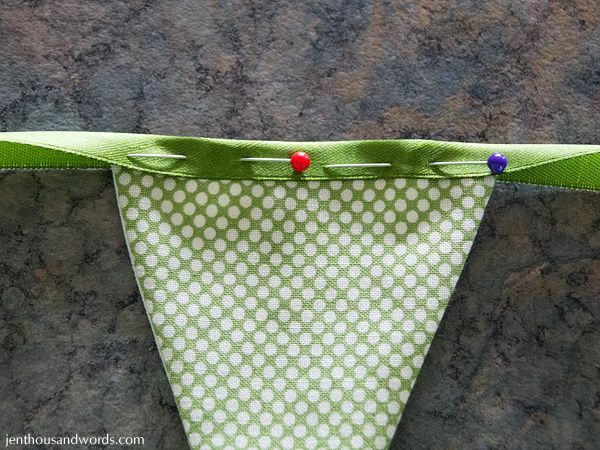 Tip: Be sure to put the pins in from right to left - this ensures that they are easy to remove as your bunting goes through the sewing machine. 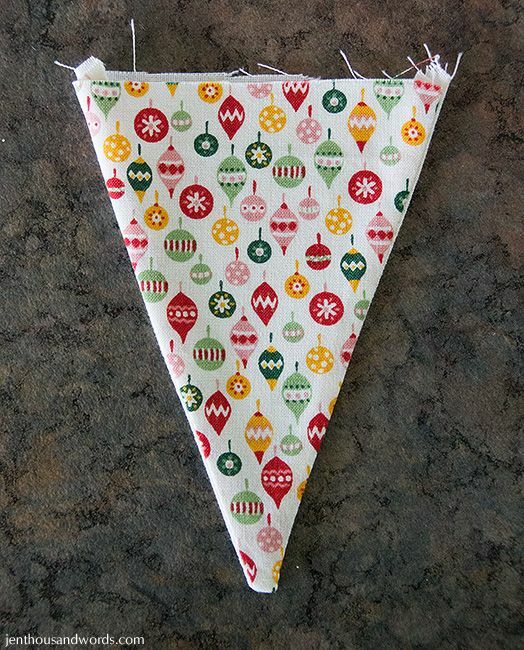 Decide how much space you want between your triangles (when I measured my bunting triangles I had thought I'd put them right next to each other but in the end decided on a small space) and pin the next triangle in, then the next and the next until they are all pinned in. 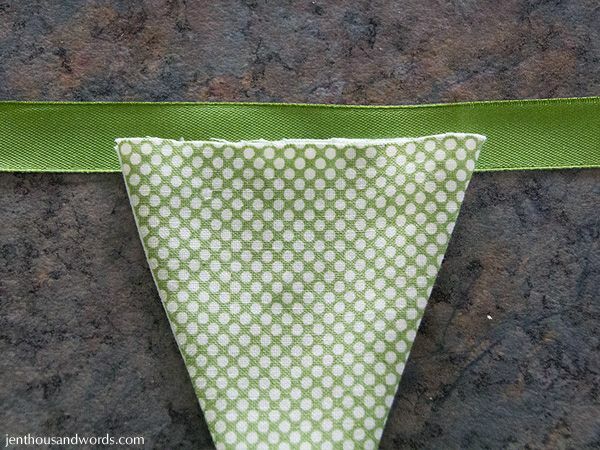 Leave a piece of extra ribbon on the other end to match the first end, then cut the ribbon. 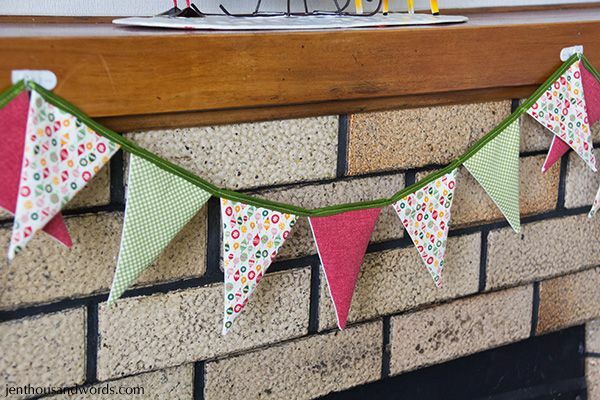 Your bunting is ready to sew! Carefully stitch through the centre of the ribbon - if you go too close to the ribbon edge you might not catch the ribbon at the back; if you go too close to the folded edge you might not catch the fabric within. 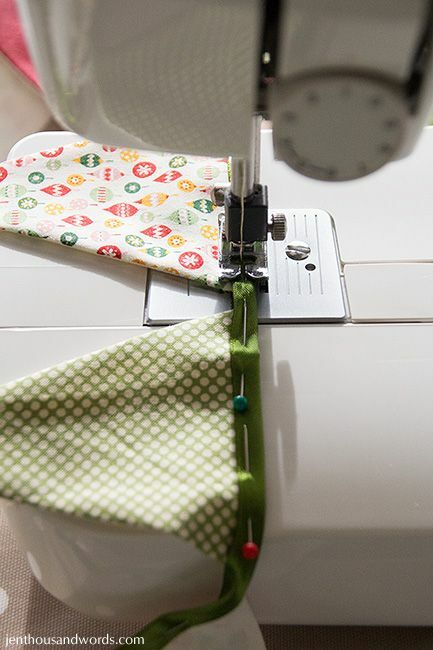 You can use a straight stitch or a zig-zag stitch; matching or contrasting thread - it's totally up to you. Clean-release hooks are perfect for hanging bunting and are removable without damaging the surface - perfect for us renters.